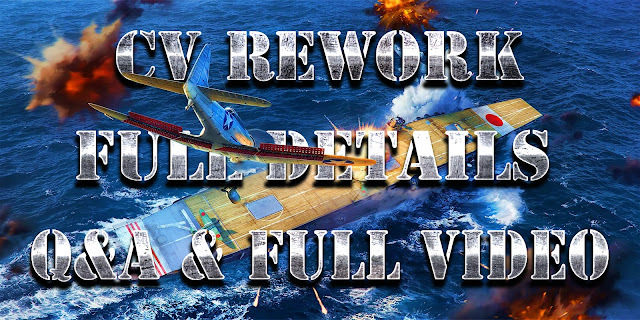 WG would like to share with you the first details about the new aircraft carrier gameplay and even show you a prototype. Before continuing, we would like you to keep in mind that all the information here is preliminary and some elements like progression, commanders skills, modernization are not yet available. The final version of this updated class will depend on the data we are going to collect and analyse at all stages of our testing. High difficulty in mastering and because of it – an excessive gap between experienced players and beginners who may be excluded from a battle without a chance to do something about it. As a result, low class popularity and no stable presence in battles. possibility of scouting using several squadrons interfering with destroyers, detecting the enemy team and actually blocking initiatives and unexpected maneuvers. Combination of aircraft carriers’ features and AA defense working mechanics resulted in a situation where it’s impossible to shoot airplanes down (for example, average destroyer chased by a squadron) or quite the opposite case where planes can be destroyed immediately (Des Moines with full AA defense set). Shooting down several planes has almost no impact on a game. Moreover, confrontation between an aircraft carrier and its target comes down to “AA Defense Fire” activation and attempts to maneuver which are easy to counter using several squadrons. Counterintuitive difference between automatic and manual attack which work very differently, and doesn’t imply any smooth skill growth suggesting a very “high bar” instead. The main gameplay doesn’t look attractive to most of the players because its main feature is managing several squadrons with a top down, 'bird's eye' view . In other words, the gameplay is “cut off” from a main battle and fixed on micromanagement. Moreover, there is a big question when it comes to “AA defense ships” and “AA defense sets”: if there are not enough aircraft carriers and its playerbase isn’t stable, why spend your modernizations, skill points and consumables on AA defense. Increase aircraft carriers’ popularity and enhance AA defense ships. In our new concept you can control your squadron directly using WASD keys or mouse. There are options for speeding up and slowing down (forcing engines or shifting to planning) when turning. Player uses only several planes instead of a whole squadron while conducting an attack. Upon attack completion, the aircraft that have expended their payloads go back to the aircraft carrier automatically. This allows players to have several attacks using one squadron, select different targets or eliminate one target with several attacks. Fighters will become an ability: player will be able to call them on a squadron’s position and after some time they will come for patrolling. Spotting enemies’ planes they will try to draw them into battle and destroy them. Fighters’ direct control hasn’t been planned because we would like you to focus your attention on ships attack not other planes. Aircraft Carriers can no longer become 'de-planed' and redundant. According to our new concept, your reserve of planes is unlimited. However, throwing them into combat thoughtlessly and recklessly will increase the preparation time for the next flight. Planes entering the zone of close range AA defense (consisting of mostly machine guns) will be guaranteed to suffer significant damage. 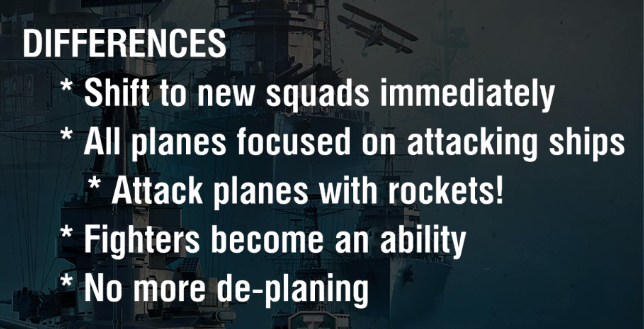 Long and medium range AA defense will aim at planes and automatically fire at them. For the player it will be obvious that some zones of AA defense are better not to fly into. As the players planes fly into those areas, they will be likely to receive some damage. Instead of the previous click on enemy’s squadron (that put priority on it), players will be able to shift between left and right sectors of AA defense. The selected AA defense sector gets a fire intensity increase whilst the other sector sees it decrease. Thus, player can face enemies‘ planes with a hail of fire from one side but the other side will be more vulnerable for the attack; it's worth mentioning that switching sectors is a very important tactical element because it may take tens of seconds. We understand that after receiving this information you may have a lot of questions and concerns. To clarify at the start: more details could be discussed later as we’re getting closer to the final implementation. For now, let’s discuss some of them. What about consumables, level up, modernization, diversity and everything? The main goal now is to test the gameplay’s basis and the concept itself. We will definitely continue our development on that case and be sure that you’ll get a lot of options for diversity and many tactical moves. So everything is being changed but I can’t even test or affect these changes? You can. We have decided to have a closed testing to make sure that everything works correctly without technical difficulties. During our beta testing we together plan to improve the gameplay, implement some partial improvements and prepare for the release. We know that most of you have been waiting these changes literally for years. However, we hope you understand that this is a global and a pretty risky task, not just changing several lines in TTC. We want to be sure that our new gameplay is enjoyable for majority, suits the game and causes no technical issues. So the answer here is pretty honest – you’ll be able to see these changes, when everything is ready. What if I wouldn’t like these changes? I bought premium aircraft carriers, leveled them up. We are fully aware how serious these changes are. 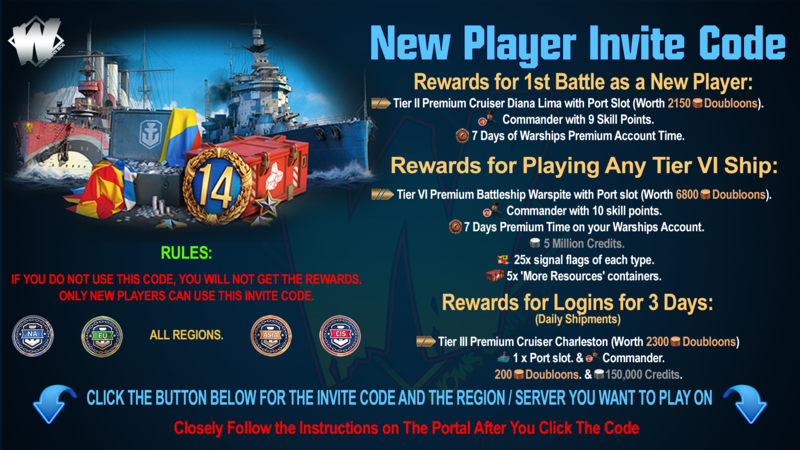 There is no need to go into detail now, but you can be sure that you’ll have an opportunity to abandon your current aircraft carriers as premium ships and leveled up ones and get an appropriate replacement.In conclusion, we would like to thank all our players who have shared their feedback with us, played aircraft carriers despite all the issues and everybody who’s ready to help us to improve our game. We have absolutely no doubt that with your support we’ll “reboot” this pretty challenging class, make it more popular, interesting, balanced and bring more diversity to the gameplay. See you soon in the air! Here is the list of possible questions that may occur after this announcement. We hope that our answers will clear the air around them!. Will rhe tactical screen available in the new concept? Yes, and for any other ship class. Will the amount of planes in squadron be the same for different nations? We are still working on that question, we hope that testing results will help us with that. Do I need to press extra buttons to get back to the base? No, but it's worth mentioning that only planes that are used up return to the base. Will you change matchmaking because of these changes? We are thinking about adding up to three aircraft carriers to the battle from each side, but this idea should be tested first. Will you rework commanders skills? We will probably rework commanders skills. Can I launch, for example, a torpedo squadron and fighter squadron and switch between them as needed? No, you can control only one squadron at a time. Will we be able to customize how many squadrons of each type we have? How many planes are in each squadron etc? No, because it's a part of the game balance and it will be set to a full squadron on each flight. Can I help in testing? Of course! Stay tuned and don't miss our news about the beginning of the public test. Will the planes skill requirements increase as you progress up the tiers? On every tier, planes speed will increase so will the power of AA defense fire. The number of planes in squadron will change from tier to tier. Moreover, ships under attack will be able to switch between AA defense sectors creating zones of AA defense attack. This will result in development of more complex maneuvers and tactical decisions in managing your squadron's attack, because chances of receiving significant damage and dealing it to your enemies will increase relatively. How does spotting work - any changes for fighter ability, returning planes, visual indicators? According to our new concept, aircraft carriers use only one squadron at a time and that decreases the spotting area. In addition to that we will add more changes. For example, which planes should spot torpedoes and when? We'll need to figure this all out during the testing. What about damage output (alpha vs damage per time)? Our changes will bring more balance to ships under CV's attack when they will receive a chance to fight back and survive on any tier. Aircraft carriers will be able to knock out their opponent in several attacks or destroy it with alpha-strike. XP & credit income changes? We change the role of aircraft carriers in a battle but XP and income will have the same principle as for any other ship class. How is the consumable defensive AA affected by this? It will be reworked but we will be able to provide more details only after testing. 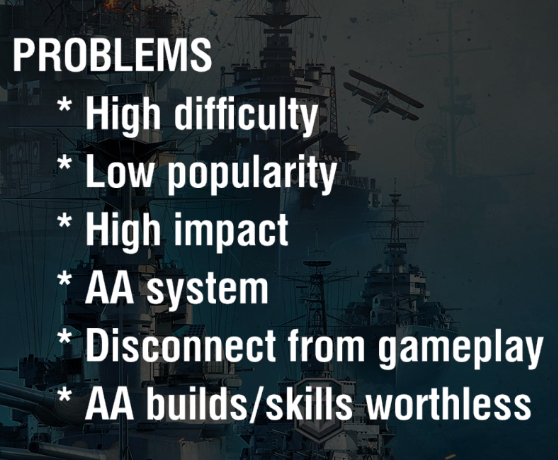 Any additional rework for non-CV AA planned (effects, skills, balance for e.g. cruisers)? 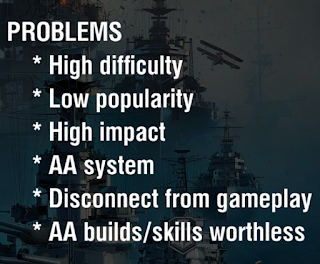 AA defense mechanics will be changed however, but AA sets for ships stay the same. Well, they've been working on it for quite long, and they were reaching the point of first external testing, yet not in time for Gamescom, but yesterday (Sunday 2/9) they got the first stable build, which is ripe for displaying. Supertest starts tomorrow (4/9). What is the philosophy/thoughts behind it, and why are you doing it? What were the problems with the current one? The problems are high skill, low popularity, high impact and strange AA-mechanics. It's a game-in-game, not really linked to how the game is played. In paper this concept of an RTS seemed cool, but it didn't work out. The skill-gap between new players and experienced players is too high, with the steep learning curve made that there was virtually no influx of new CV players. A CV has an enormous battle-impact (high alpha-damage potential) paired with a huge recon-value. This all lead to a non-popular class with only a few hundred players. The AA is also skewed, either you shoot down a lot of planes, or hardly at all. If you get roflstomped by a carrier as a DD, your AA is not strong enough to cope with that mass of planes, thus you won't shoot any down due to how the mechanics work. Autodrop & manual-drop are 2 different worlds, not scaled to each other. They want an adequate complexity-curve, where new players can get better (if they want to do it), and encourage smooth development of skill, and attractable gameplay for all players (more action-based that strategy-based). Also more ways how a CV and its targets can interact with each-other (not just "push def AA and be done with it), and a better balanced class. When you have so few carriers in the roster, the ships with the best AA are suffering from it as well, since they can't shine in the department they're "made" for, like a DM that is spec'd up for AA, then 5 battles without any carrier, that can only be remedied by divisioning up with a carrier. So people spec away from AA, and then they meet a carrier. It is less predictable performance of AA-ships. What is going to set the new CV apart from the old CV? The main difference of the new system is that right now you control 1 squadron at a time. While it may sound boring, the difference is that it is direct-control (with WASD), with speed affecting turning cirlcle, you can manoeuvre, there will be consumables. When you attack, you have to actively dodge AA-bursts. Each plane as individual hp-bars. The squadron size will increase, with separate wings separating from the main squadron to perform an attack. If you have 12TB's, you get 4 runs of 3 planes each. The devs concentrate not on fighter-gameplay, but more on plane-vs-ship gameplay. Fighters are now a control-factor, and a squadron of AI-fighters will be deployed to a sector, and will pursuit them and engage enemy planes if they encounter. There will be rocket-armed groundpounding planes that can finish off low-health targets. They will have a decent fire-chance as well. 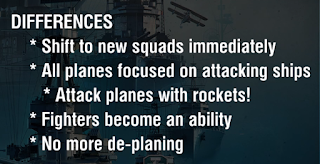 The aim is also that CV's can't be deplaned anymore, there is an "infinite" number of planes, but you'll receive penalties if you're reckless with your planes in terms of reload of the squadron. AA is reworked as well. Close-range is virtually the same, but now to individual planes instead of the squadron (guaranteed damage). Long & midrange AA will lead the target, with explosions that actually do damage now, and if you hit planes with it, you can do massive damage to them. Priority-target (clicking on a squad) of AA is reworked, and now it will be "switch AA sectors", with "focus left or right", and that switch takes time. You can bait AA to lay away the focus from the initial attack. The longer you stay in the environment of your target, the more accurate your attack will be. You'll start with a wide torpedo-spread, but with proper preparation and anticipation, it will turn into a full narrow spread. There is now a closed testing with staff & super-testers, after that CC's & known carrier-players will join, and after that a CBT-for-CV-rework will happen to which everyone can join. Will there be a refund for CV's? If the rework happens as it is, but there will be some refund/compensation to any CV-player (premium ships and techtree ships). It's a huge change, and a totally new concept, so it's nothing more than normal. The planes will automatically return to the carrier, and are "invulnerable" since they fly high. A new squadron will launch and the process repeats itself. You can auto-send your remaining bombers home before they have depleted all their runs. It allows you to utilise some tactics in terms of flight-time, reload time,... to make the most of your attack potential. In current implementation, it will be an "ability", you can summon a fighter-squadron and it starts patrolling that sector, and will auto-attack if it sees enemy planes. They'll attack on a 1-1 basis, so a 4-plane fighter-squadron attacking a 10-plane TB squadron will remove 4 torpedo bombers from that squadron. Will there be a "big wave" attack possibility, with all planes attacking at the same time? They want to get rid of excessive alpha-strike, so probably not. But they'll plan to support "multi-torpedo/bomb" strikes by planes that were capable of carrying more than 1 bomb/torpedo. The shift will move to more "damage over time" instead of "huge alpha potential". And isolated targets will still suffer hard, since AA will shoot down some planes, but not all, so you'll still do reliable damage. They don't want to nerf carriers, but they want to bring carriers closer to the game & battle. How does the CV defend itself against ships, planes? How will DefAA work from now on? Will it just increase the R.O.F. of the guns, or? It's being discussed now. They now have all new parameters at their disposal right now to work with, so it can be higher ROF, higher damage, bigger splash radius,... But the concept of DefAA remains the same: your AA will better. For now: no, the planes are coded to avoid contact-damage. It's a huge coding-effort, but it can be added in the future. For now it's very low priority. For now only against ships, maybe later it can be added. Rocket barrage is just for finishing off low-health targets, trading damage-potential for steady aim. It's basically "big HE", which will damage modules, set fires,... It's basically a salvo of HE. 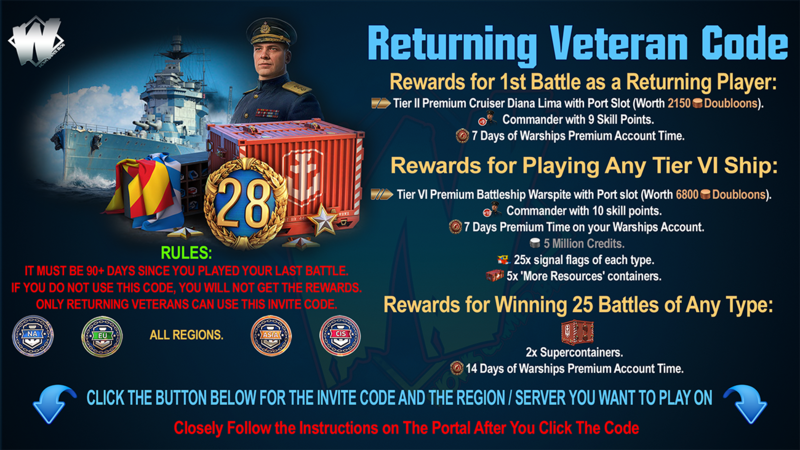 Can you div up with carriers again, and will there be more than 1 carrier/team for high-tier battles in the future? That can only be determined by testing, but it's possible. With this way the new CV's work, it's possible to have up to 3 CV's/team without being too OP. The plan is to remove all current limitations for carriers. What about Tone & Ise? If the rework is successful, the probability will grow. But they're not working on it right now, and it's not a priority right now. But ships like GZ, Enterprise,... will be rebalanced as well, so they can be reintroduced to the shop as well. Yes, in terms of design, they are working hard on a national identity for IJN, USN and "a yet to be announced nation" (read: British) CV's. They have a LOT of parameters to work with, with health HP, squadron size, speed,... so that shouldn't be an issue. No, that won't happen, despite the historical significance, but it was a special tactic, so they're not considering it, and it's also not a pleasant mechanic to introduce. What about captain skills for CV's? It's too early to talk about that, but since the CV gameplay is reworked, a rework of those skills will also be needed. If the changes are big enough, they'll offer respecs,... to offer a smooth transition. That's what testing is for, it might see some limitations. Why will carriers not be deplaned anymore, it's not realistic? For now, it's a raw prototype, and the altitude is controlled automatically, and planes adjust their altitude depending on the needs/circumstances. For now the devs don't see what manual height will bring to the table that can be useful. But if testing shows that it has a use, why not? This is not a first prototype they are working on it, they even had one where one could actively dogfight with planes, but they stripped that away: focus on the core first, the rest might come later. They are looking into it, it's a very valid remark, as it indeed looks strange. It's an early prototype, so the squadron is now "glued" together, but it can be reworked in the future. How is this all going to affect regular consumables like fighter/spotter plane? Spotter-plane will remain the same, the fighter will change a bit in mechanics, and will work like the fighter-squadron in the prototype. But no dramatic changes planned here. For now, it's out of the question, but they'll see in terms of balancing. But they couldn't keep their specs in check with regular prop-planes, so: probably not now. Can you assign fighters to another sector once you've deployed them? They are aware of it, and shall be balanced by several factors. The AA-power on this demo is not actual, it was just for display purposes. Aim needs space, so a a follow-up attack will need time to form if you want it to be accurate. It will be possible to outplay a surface ship and deal perma-floods, but it can be actively countered by manoeuvring, AA,... they want more interaction between the carrier & the surface ship. When the planes return to the carrier, won't they give the position of the carrier if the fly in a straight line? They are aware of it, and they are working on stuff. Like flying so high they can't be seen or be picked up by radar. Yes, they'll prepare everything, there will very likely be a CBT-testing so players can test,... you should be very prepared & experienced once it goes live, since it's going to take time. This is just a concept, it still can be reworked in the future. For now: it's automatic only. Will there be a LOS-check so planes can't spot through islands? Sub was lost a bit in the last versions of this prototype, but as far as Sub knows it, it is already there, but he can't confirm it. If it's not, they want to introduce it. But don't pin him on it yet, he just doesn't know. No, planes will be able to fly forever, and will return to the carrier once the ammo is depleted, not the fuel. There is a "bar" that depletes when speeding up/slowing down, but that's all. What you can look forward too in the new CV gameplay.